Located in the foothills of Canada's Rocky Mountains, each day visitors come from across Canada and around the world to explore, experience and enjoy Calgary. There are many hotels to choose from and we can help you find the most suitable based on your preferences. Although you won't find "ski accommodations" in Calgary, Calgary is a good base to start your winter ski holiday in Canada. 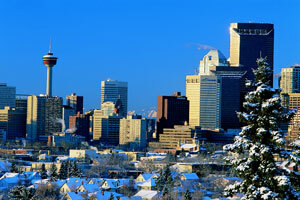 Known as the "Heart of the New West", Calgary is a vibrant city that offers the best of all worlds. A cosmopolitan city of nearly one million with breathtaking outdoor adventure and pristine wilderness in its own backyard. Check out the Calgary winter tours which can be taken one way to get you into the magnificent Canadian Rockies. Calgary is also known as being a shoppers paradise! We work with all the major hotel chains in Calgary bringing you the best accommodation and deals available. Contact us with your preferences and we would be happy to send you some options. A return ski bus from Calgary and Canmore departs to the Lake Louise Ski Area every Friday, Saturday, and Sunday throughout the regular ski season.